The Quillective Project’s mission is to turn the power of the written word into an instrument of compassion, hope, and generosity by putting that power directly in the hands of organizations that share our principles. 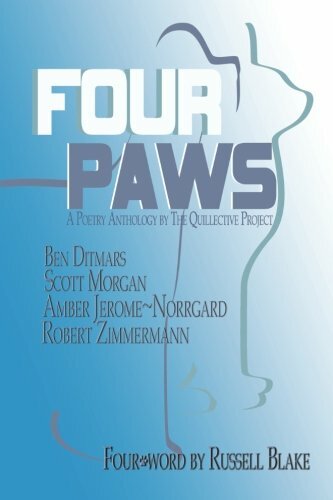 The 2013 Quillective Project is Four Paws, a poetry anthology featuring bestselling authors Scott Morgan, Ben Ditmars, Amber Jerome~Norrgard and Robert Zimmermann, with a “fourword” by Russell Blake. 100% of all proceeds from the sale of Four Paws will benefit The Dallas Humane Society’s no-kill shelter, Dog & Kitty City. Your purchase of this book makes a difference. Would you like to get your copy of Four Paws signed? You can get a digital signature and personalization from Authorgraph!! Just click below to request one.